Refer to Scoot Facebook for details re tech problems on Monday. Just did there 1st missed approach due to bad weather. Brisbane might get a Scoot. It may be quite a while away but today Scoot announced that they will be taking delivery of the 20 787s that parent company Singapore Airlines has on order. Deliveries are due to start from 2014, these will replace the 777s that Scoot current operate which means the Gold Coast will see there 787s. Could be the first 787 operator to the Gold Coast unless Jetstar beat them to it. 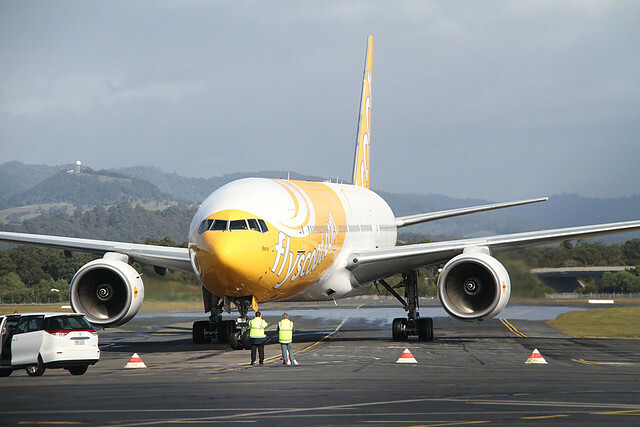 Scoot in December 2012 is adding extra service to Taipei Taoyuan, as well as Gold Coast. Flights to Taiwan’s capital sees overall service increases from daily to 10 weekly from 02DEC12 to 18DEC12, while Gold Coast receives 2 extra flights prior to Christmas. Just a reminder that there will be two Scoot flights tomorrow. The usual TZ6 and then TZ16 which arrives at 1140. TZ-006 will be operated by 9V-OTB and TZ-16 will be operated by 9V-OTD and also I noticed that the flight board the second flight is still listed as TZ-006 not TZ-16. Scoot has changed it schedule because there is a service on Sunday. This service is outlined above in LMcConville's post, it's just an extra flight put on by Scoot for the Christmas period like TZ16 the other day. Scoot have just announced that some flights in April/May will not takeoff. Pax already booked would already have been notified if it effected them. Grant G wrote: Scoot have just announced that some flights in April/May will not takeoff. CL60 N15VC due in from Hamilton Island at 1545. CL60 N15VC is due out to YSSY at 1310 and due back in again at 1555.